Scientists recently discovereda mysterious creature in the depths of the waters between Sulawesi and the Philippines. The creature has a body that resembles a worm and squid that scientists call it squidworm squid or worms. Size of mysterious creature that approximately 9.4 centimeters. Worms squid has ten tentacles long, burst from his head. In addition, he also has six so-called nuchal organ. These organs enable it to taste and smell something in the water. 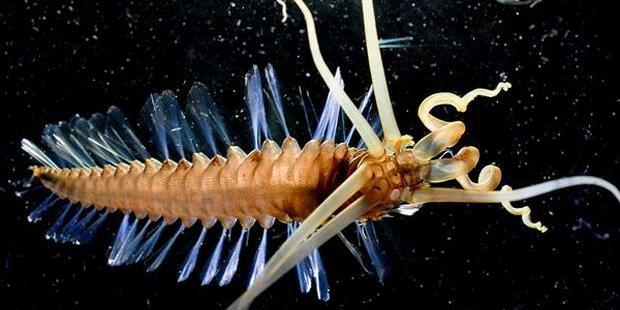 Mysterious creature was found by three marine biologists led by Karen Osborn from the Scripps Institution of Oceanography in California. They found the new species after conducting exploration in the Celebes Sea at a depth of 2.8 kilometers using cruisers controlled remotely. "I'm very excited. The animal was very tempting because it is very different from the characteristics of animals that have been described previously. These animals have the head is fantastic," said Osborn. Worms squid found by the scientists are living at a depth of 100-200 meters above the sea floor. It is known depth range is a region rich in species that have not been identified. "When I was exploring the area, I estimate there are more than half the number of animals we see an unidentified species," said Osborn. Squid newly discovered worms were given the scientific name Teuthidodrilus samae. The species is said to be not a predator. They eat a mixture of micro marine plants and animals that drowned in the depths. Celebes Sea where this species is found is a region isolated from the surrounding waters. In addition, the region including in conservation areas that have diverse forms of life and the unique geological history. Worms squid found in the region is not only a new species. The properties of squid worms are very different from other forms of life so that not only requires the name of the new species, but also a new genus, taxonomic level above species. The results of this study published in the journal Biology Letters recently.